One of the most prominent questions in education today is how can we properly prepare our students for the world of the 21st century. MPCS leadership is answering this question in many ways. As an institution striving for academic excellence and best practices for student learning and retention, MPCS has placed a large emphasis on teacher training. While we expect our children to learn curriculum, it is equally important that our staff be continual learners themselves. This is especially true of this new generation of students who do not know a time when technology was not part of their lives. To keep in step with the ever-changing spectrum of teaching tools, teachers are actively taking part in STEAM training. Specifically, MPCS is providing Code.org professional development training for all lower school teachers. Code.org focuses on the importance of critical thinking, creativity, collaboration, problem-solving, and perseverance. Best known for its yearly “Hour of Code” international initiative, Code.org is a program designed to teach students computer programming by utilizing critical thinking skills and creative solutions to solve problems. 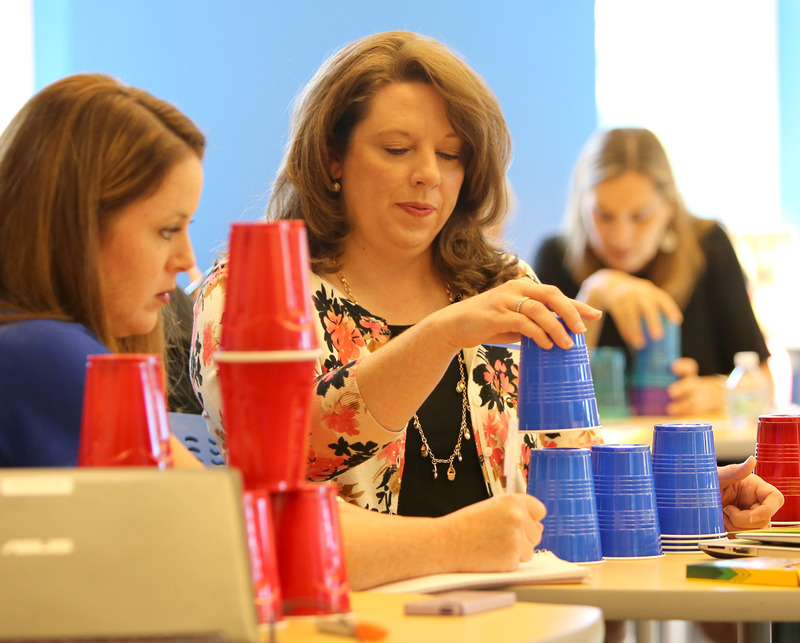 Lower school teachers recently participated in Code.org professional development training. This training supports the long-term commitment of our MPCS leadership in providing our teachers and students with resources, tools, and skills that they need to foster learning and prepare them for a technology-savvy culture and future. Our STEAM teachers, Mrs. Bridges and Mrs. Terry, are teaching our students how to program using Code.org techniques. In Critical Thinking, Mrs. Jones, incorporates “unplugged” activities from Code.org curriculum into her weekly lessons. “Unplugged” activities are hands-on critical-thinking activities that allow our students to collaborate together and develop creative solutions. The use of Code.org is being expanded where students will have direct access to using the tool in class and at home. This professional development training provides our classroom teachers with a clear understanding of this curriculum and provides them with the framework so that they can support their students' core learning. As our students begin to strengthen their analytical thinking, they will naturally find themselves beginning to think beyond obvious solutions. It is this type of thinking that will allow our teachers to take classroom conversations into a dialogue of STEAM topics and establish the connection between classroom experiences, STEAM careers, and the need to think outside the box to solve real-world problems. We thank our lower school teachers for their commitment of being life-long learners by expanding their knowledge and understanding of the Code.org curriculum with this professional development training. Tina Baker, Ed. S, serves as a teacher in lower school curriculum support, Directed Studies individualized support, and STEAM program development for Mount Paran Christian School. To learn more about academic rigor for students in preschool through high school, please click here.